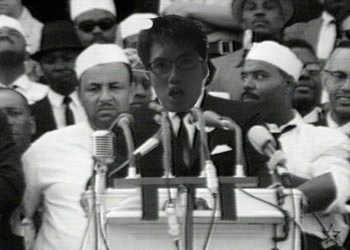 "I have a dream, that my Twitter account has more followers than Justin Bieber and my tweets wouldn't always go 'Baby, baby, oh' or 'I'm not gonna say never today! Oops, I just said never once. There! I said it again'." 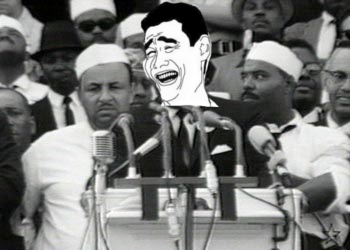 "I have a dream, that all my 9gag posts would always make it to the hot page." "I have a dream, that students would be allowed to sleep 8 hours everyday and all our assignments wouldn't be more than a thousand words long." ...that no matter how much I eat, I won't get fat." ...that every time I tell a joke, my crush would laugh at it." ...that when I open my wallet, I have exactly the amount of money I want." ...that whenever I enter a lucky draw, I get the first prize." ...that whenever I read a page in my textbook, it would automatically enter my brain." "I have a dream, that when I blog, loads of people would come visit my blog and say how good I am, so good that I could win the blog awards with my eyes closed, hands tied and only typing with my feet." Yeap, I guess I'm pretty much a first world Martin Luther King. That would explain why I am I still a forever alone blogger who spends more time in his blog rather than in the real world making it a better place to live in. Maybe I should go by the name Lukey Luther Peasant instead. But then again, 90% of the population would end up being the normal people, so I can't be blamed since statistics is not even on my side.